Such an exciting bout! Both teams had key players return that were missing from January, so no one could really predict how things were going to go. 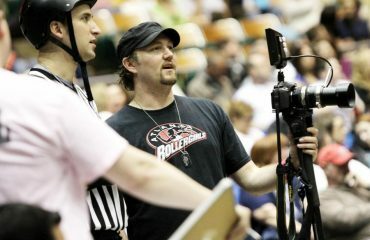 Baller Shot Caller was back in Atlanta after captaining Team USA at the Roller Derby World Cup. 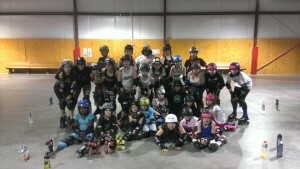 Wild Cherri, former Team USA skater has also returned from retirement and joined back with the Demons. Afro Dykee started off the game with a 10-0 jam, but then the score remained close to that until the fourth jam where Master Blazer got a whopping 20 point jam for the Demons, moving them into the lead. They held the lead for quite a while in the first half, until the Shocks put up 63 points in 4 jams! The half ended with the Shocks up 124-88. The teams doubled down at half time, and defense was key. 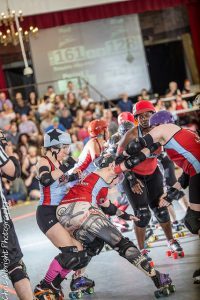 Blocker walls of Erykah BaDoozie and Luna Critz kept the Shocks jammer contained, but Owl B. Merciless, Rebel Yellow, and Git Off My Lawn were not making things easy for the Demons either. Thrash Ketchum had a 24 point jam late in the game, bringing the Demons within 11 points, but no one could stop Afro Dykee. She scored 149 of the Shocks total 224 points with a perfect 100% lead jammer percentage as they beat the Demons 224-205. Shocks move to 2-0 for the season, while the Demons are now 0-2. Our annual all-star showcase was a thing of beauty! 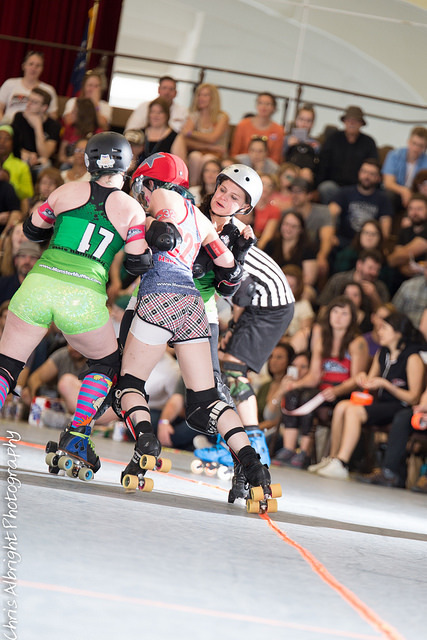 Not only did we mix up our all-stars on to two different teams, we also moved the Jammer and Pivot start lines so our friends on the other side of the building had a chance to see more action. 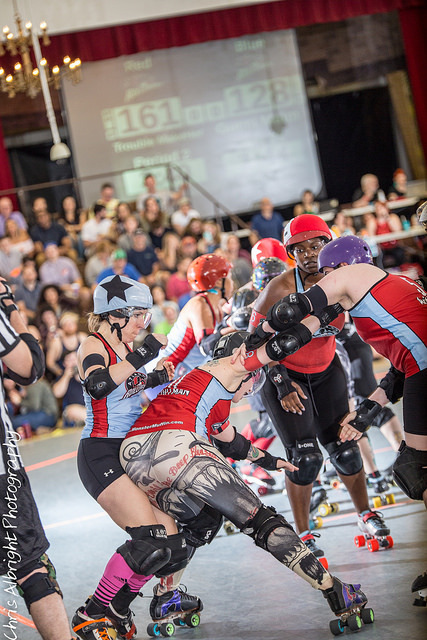 The teams put on a beautiful display of derby, and didn’t take it easy on their teammates-turned-opponents. Blue started out with a lead, but Hermione Danger changed the tide in Jam 6 for Red. Blue kept creeping back to striking distance, but just like a cat playing with a mouse, Red battled back and kept them at bay. The score at halftime was 76-64. Queen had a knockout hit on Madditude Adjustment, and they both realized they enjoy being teammates on DSDG and the Stix. Erykah BaDoozie and Arithrottle shared that sentiment as well. Gucci Maim was the top scorer for Team Blue with 43 points, but it wasn’t enough to match up to Ana Cheng’s 82 points for Team Red. Red came away with a decisive 170-130 win.